America is an extremely diverse nation with people from all different backgrounds mingling and interacting. 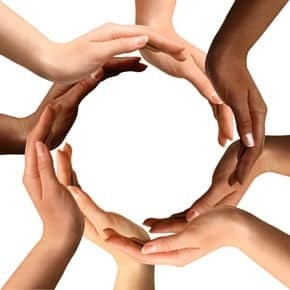 These differences in skin color, faith, culture, beliefs, and experiences create a tapestry of interwoven individuals who can learn and grow from one another. I believe that differences unite people and make them stronger. My first job, starting at a very young age was being a translator. Not for different languages but instead different accents. My father was born and raised in Mexico, traveling to this country to further his educational journey and follow his adventurous spirit. Growing up it was very apparent that sometimes, well most of the time, other people struggled to understand his accent and sometimes non-linear way of speech. Instead of “empty water bottle” he would say “bottle water empty,” and words such as “yardstick” became “stick yard”. Being young, me and my sister would laugh and tease him, nicknaming him “Yoda”, but underneath this teasing, I also saw how time after time my friends would be confused and scared to talk to him because they didn’t understand him. So, slowly I became a mediator, translating and explaining what he meant, as well as teaching him how to fix his mistakes. I wanted to make sure others understood his words, and in doing so I learned how to understand my father better as well as see connections between people that would have otherwise not been there. Because of this experience, I learned young that people are different, my father included, but this doesn’t mean relation and understanding are not possible. In fact, differences nourish growth and learning. On the news and all around me I see conflict, hatred, and fear spreading. I see Mexican immigrants, not unlike my father, being deported and feared. I see Muslims being banned and discriminated against. I see constant conflict over different ideals and ideas, warring factions convinced the other side doesn’t understand their point because of their difference. All of these indiscretions weigh on my heart because people don’t have to be the same to understand each other and unite. I think of my father. I remain firm in my stance that differences strengthen not weaken. United by Differences by Carmen is licensed under a Creative Commons Attribution-ShareAlike 4.0 International License. Carmen I really love your essay. Knowing your father I can say I experienced your translating a couple times first hand and I can see how it would help you grow. I love how you integrated your personal story into global problems, very insightful. Carmen, this piece really moved me and diversity is definitely a very important issue in our world today. It’s becoming more and more important over the years. I can’t even imagine what your dad has to go through but I think that what you do for he is so cool. Thank you for taking a stand and helping this situation just let alone in your personal life. This has really inspired me. Nice job! Wow Carmen! This essay is very well said. I think your dad is extremely lucky to have you as a daughter. As difficult as it may have been back then, you definitely learned valuable lessons from a young age that not everyone learns. In our generation people have a hard time embracing differences. Although, there can be language barriers, it doesn’t mean that we all don’t have feelings and emotions and similarities. Understanding someone and stepping in someone else’s shoes is a big step and you’ve definitely already done this. Nice job!